November 2nd was a day like any other... Until, that is, a gargantuan news bombshell dropped announcing that CBS is relaunching Trek on the small screen in early 2017! In this emergency episode - recorded mere hours after this revelation came to light - breathless hosts Cam Smith and Tyler Orton strive to unpack their own thoughts on the shocking development and the many complications surrounding it. 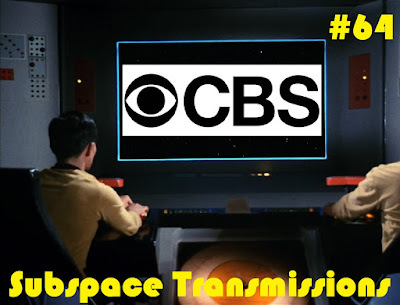 Over the course of their discussion, they debate the viability of the CBS All Access streaming business model, ponder the creative roads executive producer Alex Kurtzman may take the franchise down, and offer up their own suggestions as to what they'd like to see come January 2017. People, start your speculating engines and enjoy! Wanna appear on the show? Shoot us a 30 to 60-second audio clip telling us your thoughts on STAR TREK'S RETURN TO TV and you could take the spotlight in an upcoming program! You can also send any other questions, topic ideas or feedback to subspacetransmissionspod@gmail.com!